I love plants, but real plants scare me, as I can’t seem to keep them alive for long. And I love miniature plants. I could spend hours researching real plants to mimic in miniature, but I find that my favourite kind of miniature plants are those which look like plants but are not necessarily exactly like it’s real form. 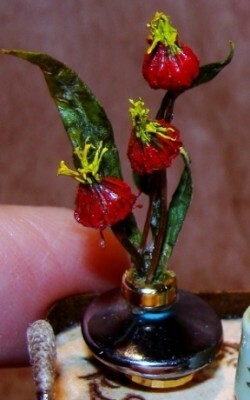 Miniatures, I believe are those items which tell your eye they are something but are not really that thing. Here is my first try at Ikebana. All materials are real dried flowers I found Ikebana, the Japanese form of flower arrangement to be pleasing to my eye. 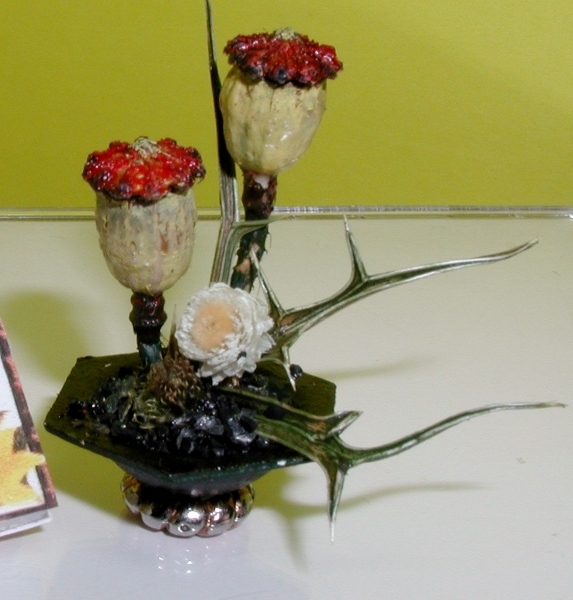 While it is made with flowers it is not the typical flower and the arrangements seem surreal using various other natural products.